I recently finished viewing a 2012 dvd called ‘Our Queen’. No matter what your opinion on the English monarchy is, the thing that really impressed me watching this documentary was Queen Elizabeth’s demeanour. She had no airs and graces in her interaction with people - both staff and guests, and was warm and friendly whilst still maintaining her distance somewhat. 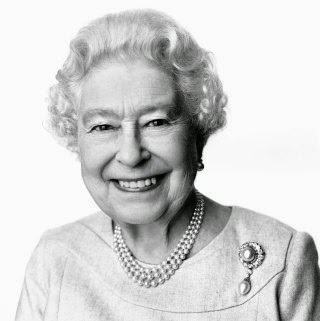 I don’t believe she thinks ‘I’m royal and I’m Queen and you will run around after me’, she is simply doing her job to the best of her ability (and expects her staff to do theirs) and has been for more than sixty years. You can tell she definitely takes her duties very seriously. Watching her throughout the documentary in different situations was quite inspirational. Words that come to me about her are uncomplainingly hardworking (she handles mail every day of the year except for Christmas day and maybe, if she’s lucky, her actual birthday) and good fun, as evidenced by her agreeing to participate in the James Bond skit for the opening of the Olympic Games. Her grand-daughter Eugenie was interviewed and said they had no idea she was doing the skit until it screened. When she asked ‘Granny’ about it later, the Queen said ‘oh well, I’ve got to show I’m keeping up with the times’. Another royal who came across well and I like her more because of it, was Sophie of Wessex. She seemed down to earth and genuinely nice. She said that even now she is quite terrified walking into big banquets as they always have to accompany a guest in, so she is in charge of knowing where to go. One time she said she couldn’t find her seat and the Queen was waiting to start her speech as Sophie was wandering around the hundreds of chairs trying to find her place name. The Queen was filmed at Buckingham Palace as well as her other castles (such beautiful scenery and stunning places!). She decamps to Sandringham each summer but the work follows her, she just does it in a different place. I love Sandringham, it’s very homey and has tartan carpet. My Scottish ancestry really comes out when I see places like that in the highlands. And the tartan carpet, be still my heart. I'd love a country retreat with tartan carpet. Who wouldn't? She looks like a little old lady, and really she is, quite tiny, and 88 years old currently, but watch her in a meeting with the Prime Minister or a group of financial men and she can hold her own. Not in a try-hard way though; she sits there listening and adding considered comments from time to time. I often find it difficult talking in groups, worrying I’ll say something stupid, not talking enough or talking too much. The Queen does not look like she has those thoughts. She is there, listening, responding and being sensible, calm, measured and stoic. The inspiration I took from this documentary was to hold yourself in high esteem but not at the expense of others, to do your jobs (both paid and unpaid) to the best of your abilities and show yourself to be a person who can be relied upon. Keep yourself to yourself and only let in those closest to you. Others you come into contact with be polite and friendly but don't give everything away. Have that Queenly mystique! Great qualities to emulate. I also very much admire her ability to work and think deeply at her age (!) and that whole keeping up with the times idea. I only lately found this blog, but just want to say -- everything I've read has been interesting and often helpful, but this series is amazing. You are to be commended. Thanks very much for a valuable addition to my day. Hi Fiona - what a great post, I love the Queen! I just have to make a small correction - she goes to Balmoral in the summer; I believe that Sandringham is in Norfolk. Thanks for doing this series again - very inspirational! I love your blog and also that DVD - HM is amazing! I recently had a gorgeous library book out - 'Dressing the Queen: The Jubilee Wardrobe' by Angela Kelly [the Queen's dresser/designer].It is just incredible the amount of planning, thought and care that went into it; every tiny detail was considered. I'm currently workng my way through the Marie Kondo book[another library gem]and have been inspired; I didn't think I had much discarding to do BUT! Even my DH careully folded our PJs this am after making the bed; he's 70 and I'm 64 so old dogs certainly can learn new tricks! I think the Queen is admirable. She always looks great, works hard, has a sense of humor, and has a lot of class.